I’m always fascinated to learn how people go about their work, whether it’s developing cookbook recipes or rehabilitating abandoned dogs. So in the hopes that this is of interest, today I’ll share a bit about the nuts and bolts of my artistic process. Recently I had the urge to paint a beautiful volute shell. First I penciled in the outlines. Then I ground a Japanese sumi ink stick in an ink stone with water to create the black ink, as shown above. Using a bamboo brush that I bought at a 150-year old ink and brush store in Kyoto, Japan, I then painted the outlines in ink. Next, I painted the patterns on the shell with Japanese watercolors, known as gansai paint. These paints are more opaque and saturated than Western watercolors. Then I drew with white crayon where I wanted the sea foam to stay white—a tricky thing to see on white paper! For the next step, I painted the sea, sky and sand, as shown in the detail above. 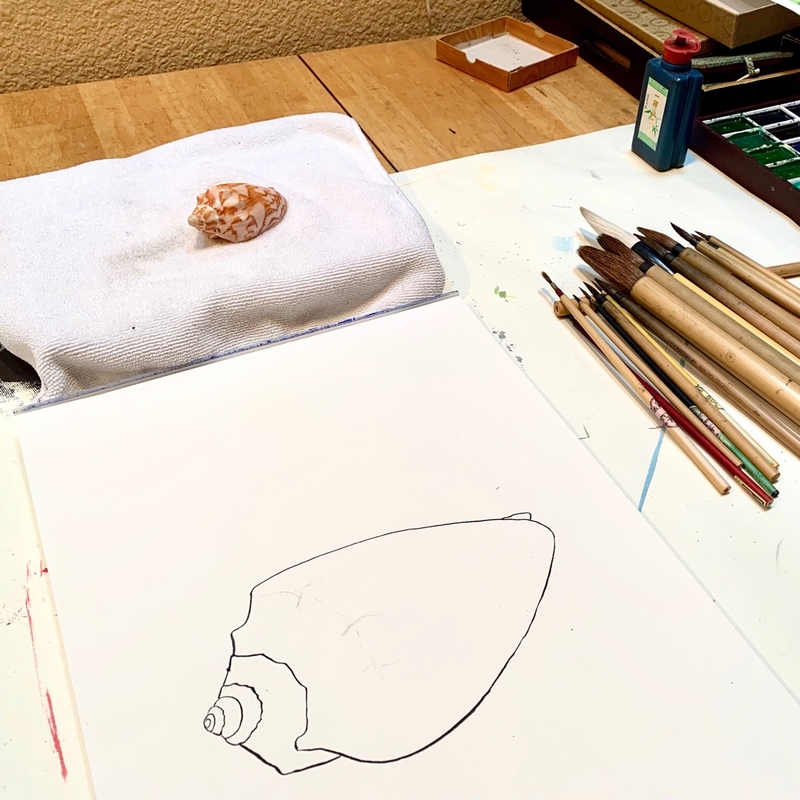 While I painted the shell from life, for the ocean background I used a photo I took for this purpose. It was the day after a big storm, and the choppy waves reflect that. My wonderful local printing company, Bug Press, professionally scanned the painting. After I laid out the design, Bug Press printed my cards and they were packaged with their envelopes. They are now available online and are finding their way into stores as part of my new spring card collection. I will be so happy if they find you! Free shipping with code HAIKU2019: I’m offering free shipping for US orders of $20 or more through next Wednesday, April 17, which is National Haiku Poetry Day. Use promo code HAIKU2019 at checkout. New spring card collection: I’m happy to share eight new and updated card designs. I have cards for Mother’s Day (May 12), Father’s Day (June 16), graduation, birthdays, weddings, sympathy and more. Mother’s Day Market: This brand-new fair takes place on Saturday, May 11 from 10 to 5 at the Humboldt County Fairgrounds in Ferndale, CA. Bring your mom or find the perfect gift and card for her! Because I won’t be able to participate in North Coast Open Studios in June, this is my only scheduled public event until the fall. Vacation plans: I’ve got two trips planned during which, unfortunately, I won’t be able to fill any orders. I will be traveling around the Southwest April 19-28, and I will be in Spain and the south of France June 4-27. Many thanks: I really appreciate all the thoughtful and encouraging responses to my last post, “When doubts creep in.” I always love hearing from readers and will respond to every message. Thank you!